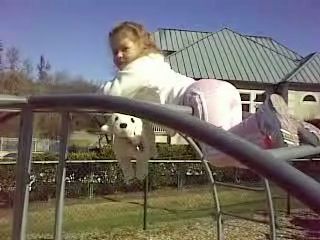 One of the favorite things for the kids to do is go to the playground in the neighborhood. Its a simple one, with swings, a slide and a couple of other things. Mara has been getting more and more bold with the jungle gym. Once she wouldn’t go past the first rung, and now she has made it all the way to the top on the last couple trips to play there. This video was taken in December. You will see that she likes spending time on the jungle gym so much she is willing to go without seeing Mr. Sprinkles, her best buddy, as well as just live on the apparatus for a few weeks. Needless to say, that did not happen, and she came down with her latest unique dismount. If you have trouble viewing this, it should be possible to watch it with Quicktime, which you can download for free here. It was recorded on my mobile phone.